"Costume Close-up: Clothing Construction and Pattern, 1750–1790"
While Costume Close-up does not have a variety of patterns for stays, it does have one, which is well diagrammed, graphed and ready for scaling up to size. These stays are typical 3rd quarter 18th century stays, covered in what is now pink (was lavender) worsted wool satin, the seams are trimmed in white leather and the edges bound in white leather. The interior of the stays have a loose (replaceable) linen lining and white leather covers the tabs (fingers) of the stays, each tab is individually lined with white leather, the leather wears well as that section of the stays are constantly rubbing and moving with the body. More importantly this book describes in detail and with diagrams 18th century sewing stitches and construction techniques. Linda Baumgarten with clear line drawings lays out the layers of the stays and gives detailed descriptions of how these stays are constructed. 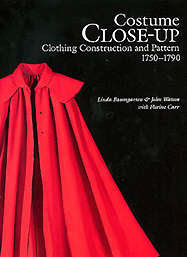 This book is a must have for beginners, advanced staymakers and all 18th century costumers. It is back in print and very affordable for the wealth of information on original garments.